Zoe Park, Author – Delicious & dark. Woohoo! 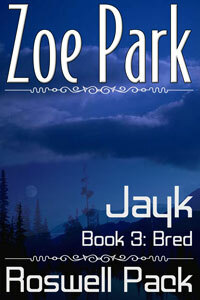 I have covers for the first three books in my Roswell Pack series. There are four brothers, Jayk, Daryk, Garyk, and Kyryk. They go by Jackson (the eldest) then Derrik, Dragan, and Kota (the youngest). 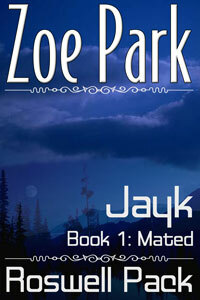 And actually most of the action in Jayk’s books takes place in and around their home in Yellowstone. Which, I know sounds weird when they’re called the Roswell Pack, but…you’ll find out why. It’s not a shifter series, really. I’ll give you a hint: if you blend the Trinity nuclear test, with the Roswell crash, and the Hebgen Lake quake…you won’t probably come up with the right answer at first, but you’ll see where those things fit into this saga once you read them. Jackson (Jayk, pronounced Jay-ik) and Katherine are the first couple. Each brother will have at least three books, and then other members of their “pack” will get their own stories. November 2, 2014 / Zoe Park / Comments Off on NaNoWriMo, anyone? So instead of stressing myself to write like a maniac, I’m going to focus on edits on current projects and getting them posted on Amazon. I thought about using a publisher, but honestly? I decided it’s better to just put it out there and see what happens. It’s all shorter stuff anyway, and dark. I know a lot of publishers like to tone darker romance and erotica down so I’m going to take the advice of my friends and DIY the process. Who knows? Maybe I’ll decide it’s too much work.